Goodness I love those Scrabble tiles! I do love that bridal layout. Love the bright cheery colors on the first! Love the different alphas on the second! These are both awesome layouts! I also love those scrabble titles! oh, these are both fabulous! 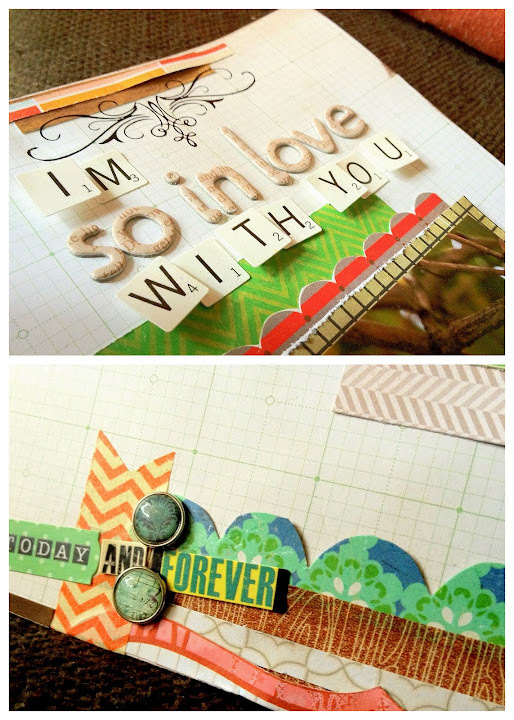 love how you used the bits of borders! These are pretty awesome Sarah! It’s fun to see lines mixed and matched. 😉 Thanks for popping by my blog and saying hi by the way!! great layouts, sarah! they are both gorgeous and fun! Fab layouts! I love that you’re pulling out “old” supplies as I’ve been doing much of the same myself. Is that your ring and dress? great layouts. i have been taking great pride lately in using my older supplies. it feels so good to reduce the stash. of course….mine don’t come out nearly as fabulous as yours. hugs. Where did you find that hanger for the wedding dress? So cute! I also like the Scrabble-esque letters you used on that layout. Wow, awesome Sarah! I love them both a lot! Beautiful flower and I love those bitsies and pieces at the bottom! Wow! I love your “no holds barred” layouts today. I hope that your rain translates to some snow for Tahoe. There wasn’t a stich of it when I was there a couple weekends ago. Sooooo beautiful! You totally rock the patterned paper. Love that you mix the old in with the new. Would never guess there was Christmas papers in there. 🙂 And congrats on the rain. I know how badly you guys need it! yeah for the combination of old and new–you make it look GREAT Sarah!